Childrens rope ladder with 7 treated hardwood rungs and 12mm synthetic hemp rope. The length of the rope ladder is 2.45m, the rungs are 350mm apart and have a width of 400mm. We use synthetic hemp for its soft feel, strength and durability outside and the top is finished with galvanised steel rings. 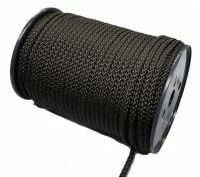 If you need some help in securing the rope ladder to a branch we have some extension ropesavailable as well as 12mm synthetic hemp rope that you can buy by the metre. (Hint: buy two lengths and have us cut and properly seal them rather than cutting one in half yourself). For a range of metal fittings to help you secure your rope ladder, visit our Rope & Chain Fittingssection.